We continue here our series highlighting the members of the Priests for Life Family who serve or have served on our staff and pastoral team. 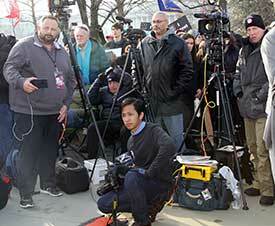 Left: Zac in action (in front, kneeling down) taking photos at the Silent No More Awareness gathering at the Supreme Court at the March for Life in Washington. If you hear someone singing in Priests for Life’s headquarters in Titusville, Florida, chances are good that it’s Zac Danao. Zac works as an information technology system administrator to make sure Priests for Life staffers have the technology infrastructure they need to most effectively fight for the unborn. Zac worked briefly in the Staten Island office and then made the move with Priests for Life to Florida.